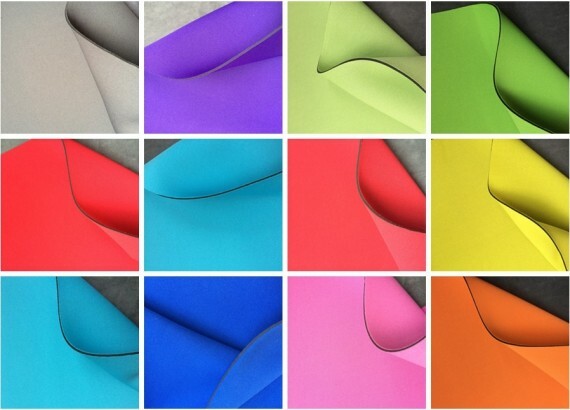 Introduction: Neoprene is one of the most popular practical promotional products available, can branded with your logo, neoprene promotional products are cutting edge, fashionable, and totally cool. Customized neoprene promotional items are a smart idea. Marketing your business through promo gifts offers a whole lot of advantages. 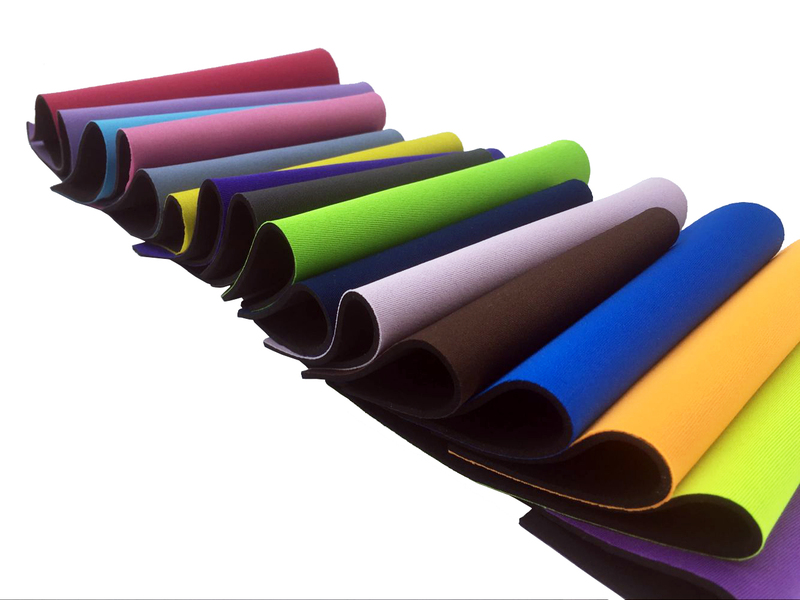 We can help you design a customized neoprene promotional item to exactly match your brand's look and color. If you are looking for a fun, smart and practical promotional item, then customized neoprene should be at the top of your list. Stubby Holders, Can Coolers, Wine Coolers,Can insulators,Wine totes,Pint glass sleeves,Sport bottle insulators, insulating beverage cans. Computer sleeves,Smartphone and iPad holders,Messenger bagsand more. All can be printed with your logo or slogan. 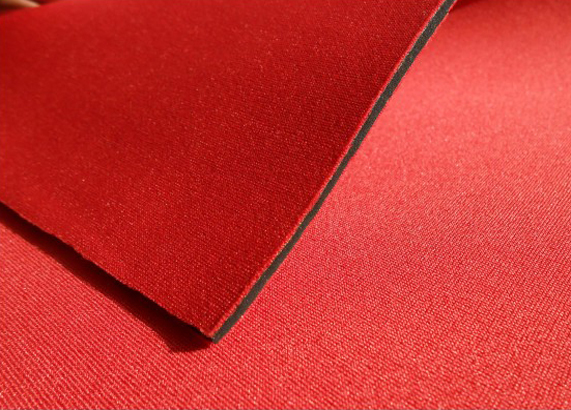 Neoprene is one of the most innovative materials in sports due to its flexibility, durability, ability to hold temperatures, and completely washable. The wide neoprene range helps to prevent injuries by having the right amount of warmth and support as well as alleviating pain caused by old injuries. 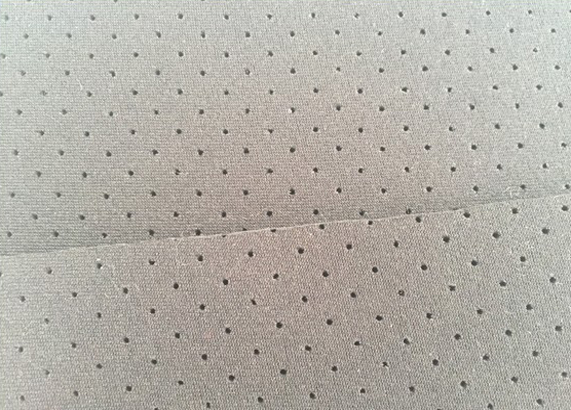 Normally use Velcro fabric/velcro-closure, perforated neoprene. Neoprene provides optimal warmth effect. Neoprene ensures flexibility in the joint. Suitable for strains and to minimize risk of future injuries. Comfortable to wear when daily work and sports. Provides support, stability and pain-relief for muscles in the back and loin. Perforated neoprene increases flexibility and breathability. Waist Belt, Back Support, Trimmer shorts, Wrist Support & Brace, Elbow Support, Knee Brace, Shoulder supports, Lumbar supports, Toe, Ankle, Calf Support. All can be printed with your logo. 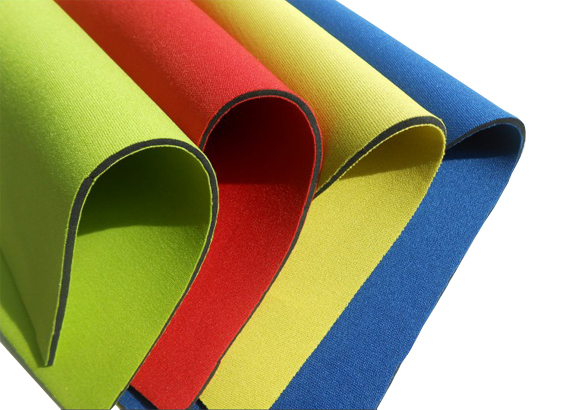 Wetsuit neoprene is the material used for garments worn by divers. Given its application, wetsuit material needs to be supremely water-resistant, tough and capable of retaining warmth. Wetsuit fabric has long been made from neoprene due to its inherent strength and ability to trap a layer of water between the skin and suit. This ingenious use of wetsuit fabric enables the wetsuit material to leave the warming of the trapped water to the natural heat generated by the swimmer’s body. Cross mesh: This has nylon one side and a mesh rubber finish on the other side. 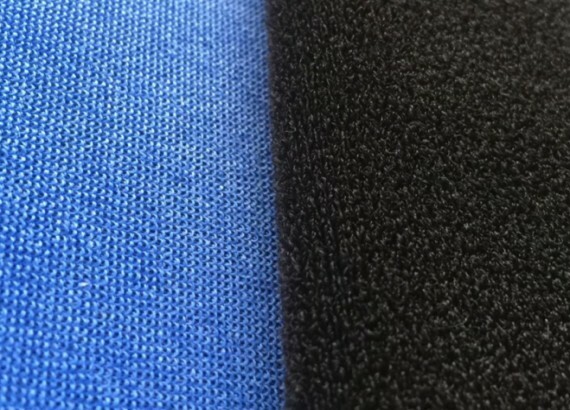 This neoprene is used alot for the chest and back panels of wetsuits as the mesh side does not absob any water to protects against wind chill as well as being fast through the water. The mesh side provides alot of grip. 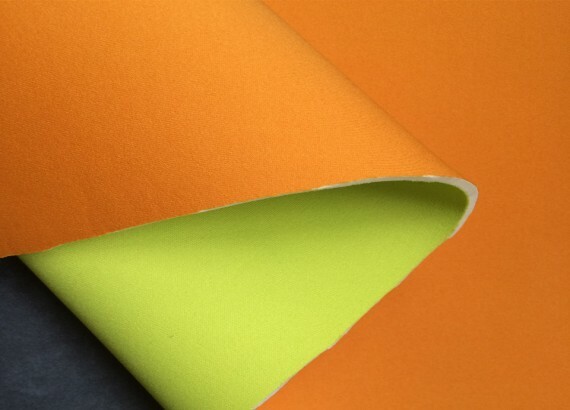 Nylon/Nylon: this is the most common and standard sheets of neoprene as it has a layer of nylon either sides of the rubber that can be various colour. Superstretch: This refers to the nylon on the rubber, it has a four way stretch as oppose to the srtandard two way street and is very flexible while still being strong. Commonly used on expensive surf suits, dive and spearfishing. Smoothskin: Is commonly found on swim suits as the water runs off and doesnt absord similar to the cross mesh, but the smoothskin is much more smooth and doesn't have any typpe of mesh. Typically smoothskin has nylon on the opposing side of the rubber as this gives it it's strength. The smoothskin can be torn very easy and must be wary of sharp objects and finger nails. 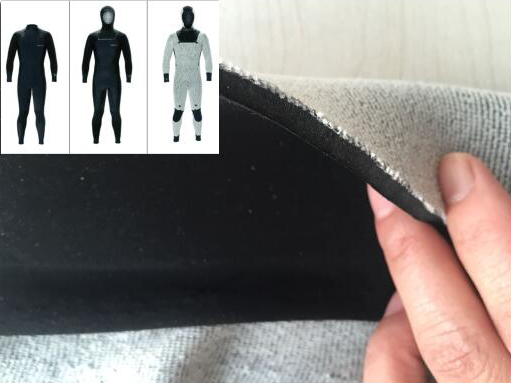 There is also smoothskin with open cell on the other side, which is used for freediving suits and is incredibly flexible, warm and comfortable. This is the most delicate combination of open cell and smooth skin and can tear very easy. 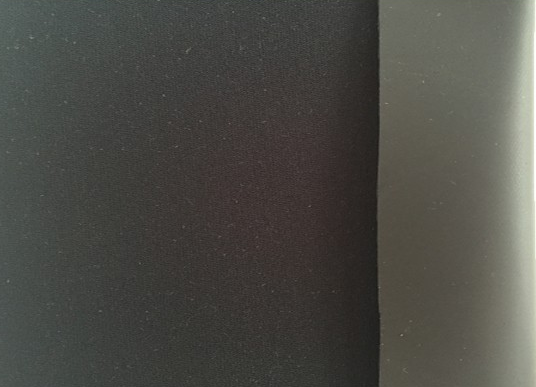 Open cell: This is the raw rubber one side that is used to mould to the contour of our bodies and provides the ideal wetsuit in regards to comfort and warmth. It is very sticky and grippy and requires soapy water to lube it up to slide. Once covered in soapy water it slides like a dream. Nylon/Open cell is commonly used on our spearfishing/Dive suits. Apparel made of neoprene, the material that scuba suits are made of, increases body temperature locally. So neoprene pants make you sweat more when working out. Supports in toning various body parts including abdomen, waist, hips and thighs. Helps in maximizing your workout routine. Keeps you body warm even while you are performing your daily activities.